We offer a free, no obligation estimate, advice, & consultation. New Jersey, We’re At Your Service. Oil Tank Services are available to contractors, heating & air conditioning companies, realtors, lawyers and home inspectors. At Oil Tank Services we offer a free, no obligations estimate, advice, and consultation regarding complete tank services to residential and commercial clients. 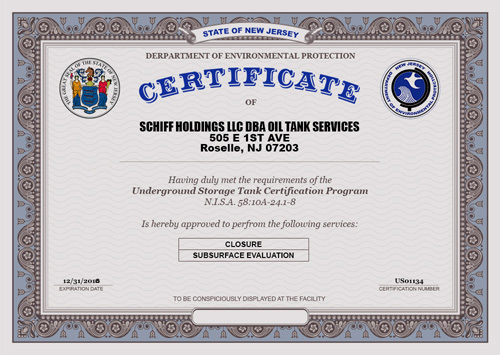 We specialize in the process of attaining government funding for oil tanks. We’re skilled in working to install, remove, and service all type of tanks. We know the risk that exists from leaking oil tanks and the environmental risks that they can cause. Incorrectly abandoned tanks on the property can make selling your home much more complicated. We will manage every aspect of your unique situation in a prompt, professional manner. Fully licensed and insured, we have more than 20 years of experience in the industry, and we perform services in all of New Jersey area. We offer dependable services from start to finish and your satisfaction is guaranteed. We offer a free, no obligations estimate, advice, and consultation. Thinking of buying a new home or selling a home with an underground storage tank? Oil Tank Services highly recommends that a tank investigation / tank sweep is performed to determine if any tanks are on the property. We can investigate your property with our equipment and years of experience in the detection of unknown tank locations. OTS can also investigate soil and test tanks before property sales. OTS offers assistance to realtors, plumbers, lawyers, and environmental testing companies. The State of New Jersey no longer provides tank removal grants. We can assist you in prior grant paperwork.